the plans would have a "devastating impact" on the character and appearance of the area, would be "detrimental to the viability and vitality of Camden Town" and would have "unfortunate far-reaching social and economic consequences". Somehow we don't think the spin doctors' worst nightmare is really a regular visitor to the tourist-and-teenage-goth-infested mêlée but we do agree with what his team have written for him. Like it or loathe it, that part of London at least has some character. London Underground reckoned Camden Market and the Electric Ballroom would be better off being replaced by an office block and shopping centre similar to that at Bond Street. Yeah, because we don't have enough shopping centres and office blocks already in London, do we, LUL? 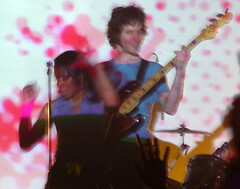 Photo of the Go! Team at the Electric Ballroom by Phil Gyford used under the Attribution-NonCommercial-NoDerivs 2.0 Creative Commons Licence.